Robin bundled up last night for Fur Ball/ Brrrrrr Ball and helped earn lots of funds to help the dogs and cats of Seguin. We didn’t get much cuddling, but Reggie and Meggy took care of each other. Read the origin of A Cuddle a Day. 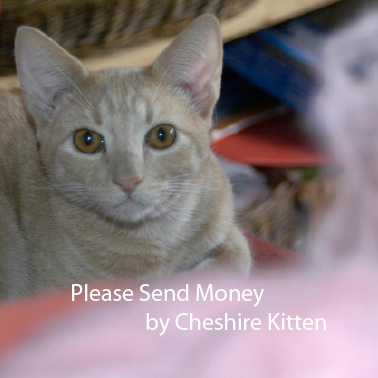 If you would like to propose a picture for a Guest Cuddle, contact me on Twitter @CheshireK or email me at cheshirekitten at sbcglobal dot net. woo hooo! Looks like lurrrrve! U okai about this Cheshie?… I s’pose u got Karma… but neow I understand why u give Reggie such a hard time, MOL. p.s. Chesh, haz Karma started returnin yur unrequited luv? Meggy has grown to be a gorgeous lady cat! I still think of her as so tiny. Meggy is still pretty little. She has short legs! Yes, Meggy LOVES Reggie. I didn’t chase him yesterday, but I did yell about him. OMC! That’s the sweetest thing ever! WoW Meggy and Reggie taking care of each other…soooo sweet! I’ve been quiet, but I’m back, at least for a while. The book is 5.25" X 5.25" with 36 photographs. I will pawtograph if you like! Shipping is free to U.S. addresses. Please contact me at cheshirekitten [at] sbcglobal [dot] com if you want the book shipped to a non-U.S. address. 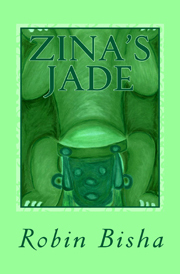 Zina's Jade is a novel. Available in paperback and Kindle editions. Reviewed on Adventures of a Suburban Kitty.